Owning a betta fish is a wonderful thing and making sure it stays healthy is very important. 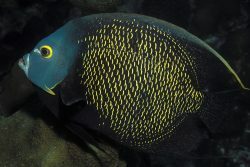 Many different aspects go into keeping the fish healthy and stress free, but one of the biggest things is their diet. Betta’s are picky and temperamental with many things including their food. Getting your betta on a regular diet is the first step to ensuring its health and promoting a long life. Their food and diet will also enhance and bring out their natural color and beauty. 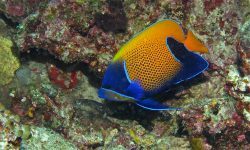 Feeding your fish is one of the first and most important aspects to think about. With all the different fish food options out there, finding the best betta fish food can be a daunting and tiresome task. We have put together this list of the 7 Best Betta Fish Foods to try and help alleviate your worry and help you find the best food for your little fish. They are part of the family now after all, and you need to make sure they are fed and treated right! How often should I feed my betta fish? Typically you will feed them 2 to 3 times a day and usually 3 to 4 pellets, but read the package instructions as it can vary depending on the size of the food. Below you will find a list of the Best Betta Fish Foods. We have included some general information about the food as well and different aspects that might help to make up your mind. Lastly we highly some pro’s and con’s of each. Hikari Betta Bio-Gold is literally the gold standard for the best betta fish food. It has been developed through substantial research looking at all aspects of betta fish nutritional needs. Betta Bio-Gold helps to promote healthy and long lives by giving them all their nutritional needs as well as immune system support. This Betta fish food will help enhance the natural color of your betta and brighten it up while preventing color fading. Hikari Betta Bio-Gold provides a balanced diet with vitamins, including vitamin C, to help keep your beloved betta stress and disease free, which helps promote long healthy lives. Hikari Betta Bio-Gold comes in a dispenser package that helps you to control how much food to feed your betta and helps to prevent overfeeding, however it’s not perfect and has some flaws, and we recommend avoiding using it. It’s manufactured with high quality ingredients using specialized equipment. Betta fish are carnivores, do best with floating pellet food, and can be very picky with their food. That is why we believe this is the best betta fish food as all aspects of the betta are addressed and met by this fish food, making it the the best and our number one choice. If you are only looking to try only one food for your betta or just want to start with the best, Hikari Betta Bio-Gold is the place to start. It might not be the final choice you go with after trying it on your betta, but if they do like it you won’t need to look at anything else. 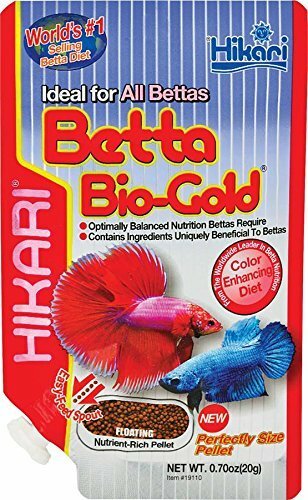 If you have a new or baby betta, you can start with the Hikari Betta Bio-Gold Baby Pellets and then switch to regular after the package is done. Tetra Bloodworms are another good option for you betta fish. These bloodworms can actually be used as their main diet or they can be given as treats. Obviously feeding bloodworms to you betta as their regular diet is an option, but sometimes they can be great as a treat given one to two times a week instead. If given as a treat, your bettas will definitely go a little betta-crazy for them, the definition of what a treat should be. They will appreciate the small treat every time. Tetra Bloodworms are carefully freeze dried which helps to retain the maximum flavor and nutrition they can possibly offer. It offers high quality mineral and vitamin enhancement, offering your betta extra energy and making it a solid food choice for your little betta. Freeze dried bloodworms are excellent for carnivores, which bettas are, as well as other freshwater and marine fish. Bloodworms are a high protein daily diet or as mentioned before, can be give as a treat to help vary their diet. The size of the freeze dried fish food also help you give the right amount of food to your betta. Tetra Bloodworms are recommended as an good diet if your betta has been picky with some of the other pellet type of foods. Alternatively they make great treats to keep your betta happy and stress free. Don’t hesitate to try bloodworms on your betta. However, one major issue to aware of is that these have been known to give allergic reactions to some people. The allergic reaction stems from the insect larva found in the ingredients. If you are going to try these but are worried, use gloves as a precaution. 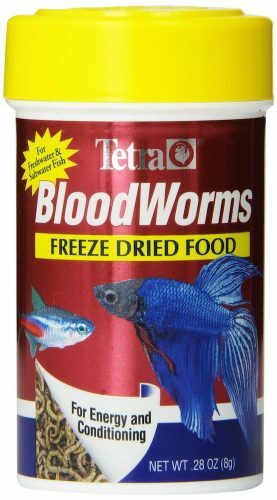 If you prefer not to find out if you have an allergy, Omega One Freeze Dried Blood Worms are a great alternative to the Tetra. In their ingredients they omit the insect larva. Ocean Nutrition Atison’s Betta Food have undergone extensive testing to ensure your betta fish are getting the best food they need. This betta food is made of high quality and only the freshest ingredients. It’s formulated to enhance the natural color of your betta and won’t cloud the water like cheaper fish food alternatives. It offers a complete nutrient rich diet and you betta will be healthy, happy, and stress free. Ocean Nutrition Atison’s Betta Food comes in a pellet form that are small and easy to digest by your beloved little betta. It helps to promote a longer life through its special breeder formula. Picky betta’s tend to prefer pellets which is why this is one of the best options. These pellets float, won’t dissolve, and won’t interfere with your water clarity or quality. Overall Ocean Nutrition Atison’s Betta Food is another great option for your betta. 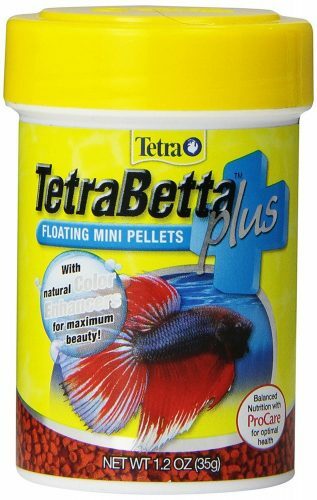 TetraBetta Plus Floating Mini Pellets comes in 4th on our list and is another good floating pellet option for your betta. These pellets are produced with high quality ingredients from one of the best and well known fish food brands. It offers vitamins and nutrients to help support your fish’s immune system. Offering high protein and Omega 3 fatty acids, this betta food promotes growth and gives your little betta natural color enhancement. This like the other pellet food options listed above will not cloud the water when you are feeding your bettas, assuming you use as directed and do not add too many or overfeed. TetraBetta Plus Floating Mini Pellets are small and easy to eat, however they are not as small as they advertise. These are not recommended for young or small betta fish, but they should be no problem for older and medium and up sizes. Tetra, however, is one of the best fish food brands available and make many high quality fish products. When buying their products, you know that you are purchasing quality. If you are looking for the best betta fish food other than pellets and bloodworms, TetraPRO Betta Crisps is the option you should consider. This food consists of a mixture of colorful tiny floating crisps that are easy for your betta to eat, swallow, and digest. It contains advanced nutritional properties that are an ideal staple food and help with your betta’s health and well-being. Since this fish food is crisps and not pellets, it helps maintain clean water and won’t cloud if sitting too long. Tetra once again is a well known brand in the fish food industry and offers excellent quality products. 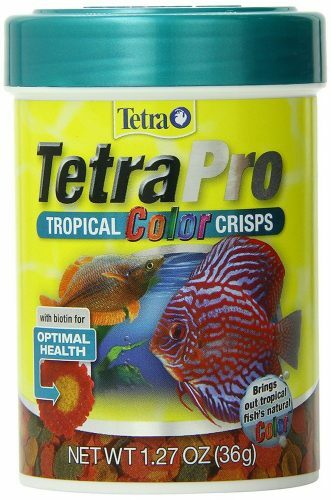 Since TetraPRO Betta Crisps are more than just for betta’s its not made specifically for them and therefor has one big issue. The crisps tend to sink quicker than the other fish food in this list. If you feed the right amount and at the right intervals, your betta should have no problem finishing them before they fall, but if they don’t they will fall to the bottom and will not be eaten. Luckily they will not cloud the tank, but over time could cause cleaning issues. 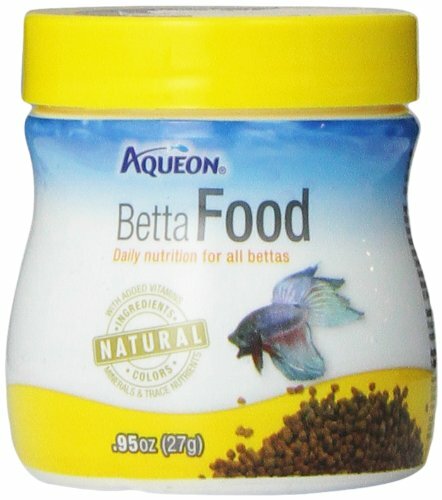 Aqueon Betta Food Pellets provides a cheap and easy option when it comes to the best betta fish food. The ingredients in these pellets offer a balanced nutrition for daily feeding. It includes many premium ingredients that betta fish enjoy eating. The pellets are a good size to help prevent overfeeding. These pellets use a unique formula which help promote the health and energy of your little betta. They also contain only natural ingredients that help to enhance the natural color of your fish. Aqueon Betta Food Pellets are a good pellet size for your fish, but it is recommended to add one at a time and wait until your betta has finished eating the first until you add more. Two to three is a good recommendation for amount of pellets per feeding. These pellets will work well alone or pair them with bloodworms a few times a week for a complete diet. One of the issue with these pellets is they do seem to sink quicker than other pellets and can cloudy the water and will then require you to clean more often. 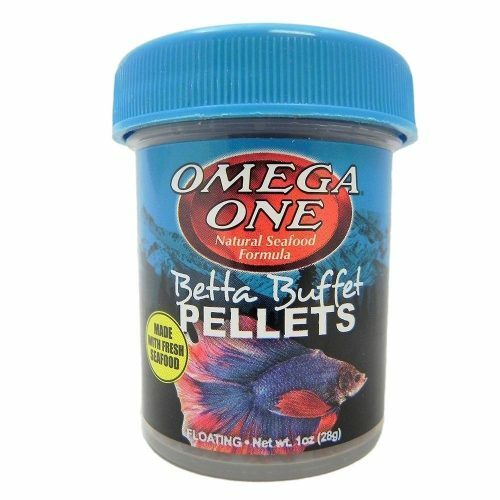 Omega One Betta Buffet Pellets Betta Food is the last on our best betta fish food list. While they might be last, they are still a good option for many betta owners. These pellets offer some of the best ingredients and nutritional properties. They offer high protein and Omega 3s and 6s and provide a variety of fresh seafood protein, just what a betta needs. It also offers natural salmon skin pigments which help to bring out the vibrant colors of your betta. These pellets are nice and small making it easier for your betta to eat and digest, and provide quality all round. 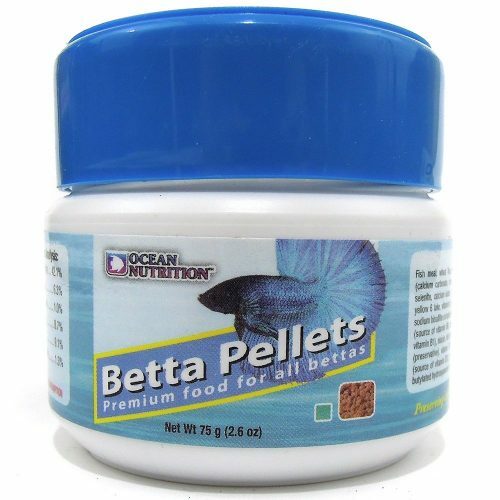 Omega One Betta Buffet Pellets Betta Food offer a good pellet size, however consistency in the size is an issue bottle to bottle. Some bottles the pellet sizes are bigger than others. While this is not an issue with older and larger bettas, if you are expecting small pellets you might get that one inconsistent bottle. The majority of people will not have an issue with this past the first few months as your betta gets older. These pellets also sink quicker than some of the other pellets listed and therefor can create cloudy water issues as well and more cleaning. We hope that this guide provides you all the details and information you need to make an informed decision about which food option to go with. They are all great options and you won’t go wrong with whichever brand you choose. Let us know with a commend below what you think, which one you use, and if we missed any you feel should be on this page.